Something interesting I'm often asked in interviews is how I balance fact and fiction in my novels. And it's a very important balancing act! I often tell the following anecdote: I used to belong to a writer's group in Berkshire, which ran a twice yearly short story competition, just within the group, and on a theme. 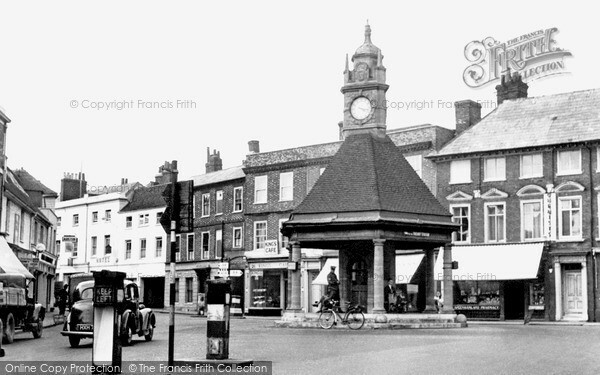 One spring, the theme was the town where we were based, Newbury. The stories were judged and scored anonymously, and the one I rated the highest, and which went on to win, gave an overview of the history of Newbury itself via the rise and fall, the life and times of one Newbury family across the generations. It was well written and I was pleased to have learned something of the town's fascinating history. Except, I hadn't. When I approached the author of the story to congratulate him, he told me airily that he'd made it all up. I was outraged! I thought I'd learnt something. I thought he'd done research. I knew his characters were fictional, but I'd supposed their actions to be based in historical fact. At that time, I had just started to write my first novel with a historical setting, and the incident taught me a valuable lesson. I wanted readers to come away from one of my books entertained and moved, but also able to feel that they'd learned something. And if they'd learned something about a piece of history that was completely new to them, then so much the better. I think there has to be a bond of trust between historical fiction author and reader - trust that, however extraordinary the story, the author has done enough research to bring their story alive, and to portray society, place, manners and politics of that era as faithfully as possible. Because if you can just 'make it all up', what's the point? You might as well write a fantasy novel (though this might be the trained historian in me speaking!). And it's often easy to spot when an author hasn't done enough research into their era, and can't furnish the story with real detail. But here's a big but: what if the demands of your story go beyond the established facts? In The English Girl, which is set during the Jebel War of 1958-59 in Oman, I needed a certain set of characters to meet. But, realistically, I knew from my research that they probably never would have. So, I tweaked history. I had officers of the SAS, newly deployed in the battle, find the time to have dinner at the British Residence in Muscat, so that my characters could get involved with each other. In The Night Falling, I wrote one of my fictional characters into a real life massacre of starving Italian farm workers by fascists landowners - though I was careful to give the names of those who really did die at the back of the book. In both cases, I stuck to the true course of events as closely as I could in all other respects. Now framed and on my wall, the photo of a Puglian peasant wedding from 1920, found in a Devizes junk shop, that initially inspired The Night Falling. I'm similarly nervous about using real-life characters in my novels. With a very few exceptions - the Sultan of Oman, for example - everybody with a speaking part in one of my novels is fictional. I don't even like the term 'based upon', because it still implies some filching of a famous person's actual life, career or personality - putting words into their mouths and deeds into their lives that they never in fact spoke or did, though there are a great many authors who are quite happy to do this, and make it work very well. I tend to go with the term 'inspired by'. To give a couple of examples, my character Maude Vickery, intrepid Victorian female explorer in The English Girl, was inspired by Gertrude Bell (as I talked about in an earlier blog). In A Half Forgotten Song, the character of Charles Aubrey was inspired by the charismatic, Welsh, post-impressionist artist, Augustus John. 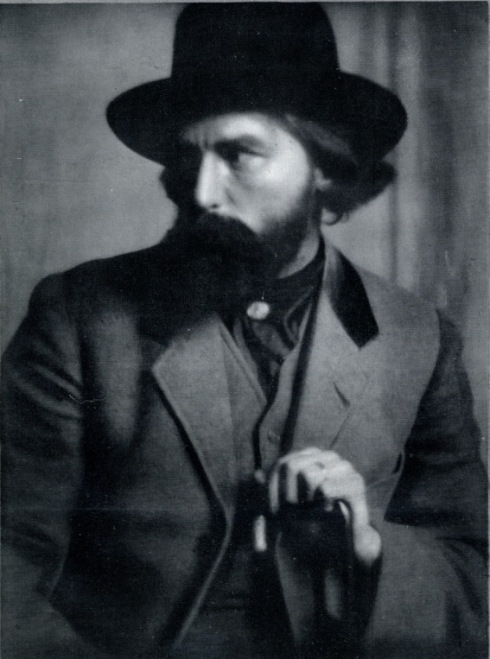 Augustus John, photographed in 1914. Brooding charisma present and correct. In both cases, I took themes from these characters' lives - what it was that made them extraordinary - and used that as the starting point for a character of my own - one who embodied what had fired my imagination about the original, but one in whom I could invest the personality, motivations, and titillations I needed for my story. I once heard Phillip Pulman say that writers are like magpies, and I think this is particularly true for historical writers. We can roam all of history, picking out the bright, exciting parts that catch our eye, and gathering them together. 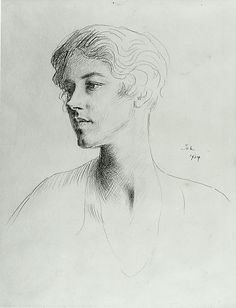 With Augustus John, for example, it was his beautiful drawings of women that caught my eye - I'd known them for years, having worked in a printing factory in my summer holidays from college, where we printed a book of his work. Like a magpie, I swooped in on the idea of a man of huge talent and irresistible magnetism, who loved women and saw no reason to limit himself to his wife, mistress or mistress's sister... But I had no wish to write a biography of the man. I wanted to take a man like him, and put him into extraordinary events of my own creation. But it's a tricky business. Obviously, no serious author of historical fiction would include glaring anachronisms, or deliberately set out to rewrite history to better suit their plot. But at some point, unless you are writing a serious, factual tome, this rewriting of history is bound to take place. So perhaps that is the bond of trust between reader and writer - that the author will only tweak in small ways - and in plausible ways - in a wider setting of historical accuracy; and that the reader will forgive them for it, and enjoy the story as much as the history! It is a tricky business. Even writing about 'facts' is tricky; I've often found that when you dig a little, you find there's not much evidence for something you may hitherto have thought to be an incontrovertible fact. Sue, you're right on that! Researching Eleanor of Aquitaine via her biographers was definitely proof of that one for me. I found her described by historians as having been a blonde, a brunette and a red-head with blue eyes, green eyes and 'flashing black eyes.' Thing is there is not one single description of Eleanor in existence. While I can forgive this in fiction without a second glance, finding it in supposed non fiction works is a bit more of a problem. Histories are written with a slant toward current pet theories and attitudes in society too. Again with the Angevin bunch, Amy Kelly, wrote the whole Courts of Love theory which has now been thoroughly debunked as never having happened but was swallowed hook line and sinker from the 1950's until the present day. Richard the Lionheart being gay. This theory was taken up post war, based on misunderstanding of the Medieval mindset. Now revised, but Joe Public hasn't cottoned on yet and by the time that happens, the theory might have been revised again. I do write about real people in fiction. My main rule is to research in depth and for each of their actions to ask 'On a scale of 1-10 could this have happened? Could they have said this?' If the answer is between an 8 and a 10 then I'll work with it. Lower than that and I'll find a way round that doesn't distort history. Marrying the history and the story is a fun part of the challenge. I love the idea of a scale of plausibility, Elizabeth! Yes - so few watertight 'facts' out there - everything so dependant on who was watching, and why, and why they chose to record it, especially true the further back in time you go, I imagine. But I even found this with my latest, set in the 1950s - in accounts of the Jebel War by different British officers who were there, their attitudes, and descriptions of events and the people involved, were very varied. This is terribly interesting, Katherine. I've moved from writing realistic fiction to writing historical fiction with a streak of total fantasy - time travel. In my Bedlam Trilogy, which will be published as one volume next year, I started with fictional characters and then became interested in writing about real people: the artists Richard Dadd and John Martin and several others. I read everything I could about them, as much research as I would have done if I had been writing biography, and then imagined the gaps. The time travel entered the story because, having tried to decide what I thought about them, I started to wonder what they would think of us in the 21st century. It seems to me you can put absolutely anything into a novel.